Do you think that it's possible? I posted this on thread 'C & Q= same robot? ', but it was old, so i wanted to make new thread about it. Quote is a normal robot, but he gets knocked out by someone and loose his memory, also, something breaks his wiring. But it isn't anything special, it shows up later. He helps mimiga and all. But, when he sees a small mimiga house (the one with curly inside), he resembles that he was once killing mimiga, years ago. Then, his broken wires are creating his second personality, Curly Brace. Curly tells him that he probably killed mimiga in the past, like other killer robots. Then he's trying to kill his second personality, but it's too strong. Also, Curly is someone that he always wanted to be, happy, helpful and able to talk. Because Quote can't talk. After the battle, Quote forgets about killing mimiga, so Curly feels a bit confused, she don't know why was she fighting him, and vice versa. Quote wants to keep Curly with him, because he thinks that he can learn from her. Curly is inside Quote, but she is 'sleeping'. Until he goes to labirynth. He feels that he will never get out of here, so he is depressed. But then he meets 2 friendly creatures, nurse and physician. He gets hope, so Curly wakes up and she tells him that there is a stone that will make tchem escape. Of course she only imagined it, there isn't any stone. You can't escape from the labirynth. So he goes to find that stone. Then he sees that booster dies. He is depressed once again, but this time the feeling is much stronger. But Curly motivates him to find this stone. He goes there, and he faces his depression, which is that stone. Then Balrog appears. Balrog is his 3rd personality, the bad one. That's why he fought him many times, and always won. But this time Balrog is sad, too. So he helps them with fight, and disappears, Quote's 3rd personality dies. Quote faints. He resembles his mission to destroy the core. He resembles his friend, destroyed robot in the Core room. He resembles his death and his fight with the core. Then he resembles his girlfriend died. Curly was created to resemble him his girlfriend. If we skipped Booster, Quote ignores the fact that he died, it makes him strong and he also ignores the fact that his girlfriend died, he imagines that he saved her. But if we won't skip him, Quote will fall into total depression after resembling His girlfriend's death. Curly also died at this moment, i mean his 2nd personality. Now there is nobody to help him. In his memory, he comes back to the place he loved, the mimiga village. But it's destroyed. Just like Quote himself. He goes to destroyed egg corridor. Then, if we choose to fly with Kazuma, Quote suicides. But if we choose to stay alive, he goes to plantation, he believes that he can still help his friends, who were kidnapped by doctor. In plantation, if we ignored Booster's death and saved curly, he can see her, she comes back to him to once again help him. 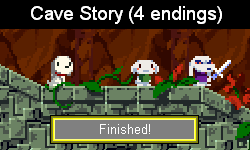 But otherwise, we go to the last cave, which means the last chapter in Quote's life. Last cave is Quote's discussion with himself, about his suiciding. After we pass it, Quote faces his 3 fears: Misery, his mother who never loved him, the doctor, who kidnapped his friends, and finally the core, his worst flashback, in which 2 of his friends died. After he kills his fears, he saves some of his friends. But he suicides, due to other friends death. If he saved Curly, she tells him that he is ready to rescue all of his friends, who are in the doctor's 'office'. So he goes to his base, or whatever, which is the hell for him. After long journey he finally is ready to face the doctor himself. in the best ending, he saves all of his friends, and he stays alive to the end. 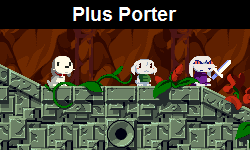 -The doggy appearing in some parts of the game, plantation and Ballos' chamber, is his dog who died, and he was Quote's best friend. -Jenka is his grandmother, another good person. She had dogs, and he got his doggy from her. -Itoh is Quote's father, who was always escaping from the problems. -Momorin is his friend's mother, she was very nice to him. Also, sorry for my English, i am from Poland. Hope you like my theory anyway. It might be a good idea to add a few spaces between lines, I(and I guess I won't be the only one) am having trouble reading this due to being a massive wall of text. Curly never said that. She said that Quote came to kill the Mimiga, thinking this would count for every robot. She learns that this is not true the difficult way though. Ok, thanks. BTW, i am making video version on YT of my theory. But it's very hard, so it will take some time. It'll be in polish, but i'll add subtitles. Curly tells him that he probably killed mimiga in the past, like other killer robots. Then he's trying to kill his second personality, but it's too strong. Also, Curly is someone that he always wanted to be, happy, helpful and able to talk. Curly also states that she probably was also a mimiga murdering robo herself. the idea behind the silent amnesiac protagonist is that the protagonist is the player. the player's words are the protagonist's words (I found this out from a interview of Pixel). in the best ending, he saves all of his friends, and he stays alive to the end. care to go into a little more detail on that? how does Ballos fit into this? When Misery sends Blargo to save Quote and Curly representaion that "Qoute's Mother" actually loved him this whole time? Is flying on Blargo representation that Qoute has accepted his past and himself and is moving forward? I always hate it when my friends turn out to be delusionary fragments of my personality! Does that mean Quote gets tired of collecting puppies for kind old Jenka, knocks her down and steals the key from her for... his Mom? Then sees something horrifying in the "storehouse", might be a delusion or being caught by the Doctor, but it sends Quote into a spiraling depression into some dark Labyrinth. Or maybe locked up in the asylum..? OMG WHAT ARE WE DOING TO CRAVE STORY! It all makes sense now. The Doctor is Walter White growing his "red sky" flowers for the eager Mimigas. Quote must be the DEA's task force killbot. This whole game is just an elaborate advertisement against doing drugs. Wow, hard to believe this was three years ago. I wouldn't beat yourself up over it too much, you're not unique. Even some of the most respected users had some mishaps in their early days. Most of my older posts were somewhat cringeworthy looking back. I think a lot of today's "quality" users were pretty insufferable when they first joined the forums... don't even get me started on GIRakaCHEEZER when he first joined. A lot of people were also very fascinated with Quote99 and his theories. What made him especially charming was that he was 12 when he made most of his posts, and also that he's German and his English was a little bit broken. don't even get me started on GIRakaCHEEZER when he first joined. I meant that depends entirely on how far you look back. I would argue that early early GIR was much nicer. As was I (or pretty-much anyone else here?) when I first joined.